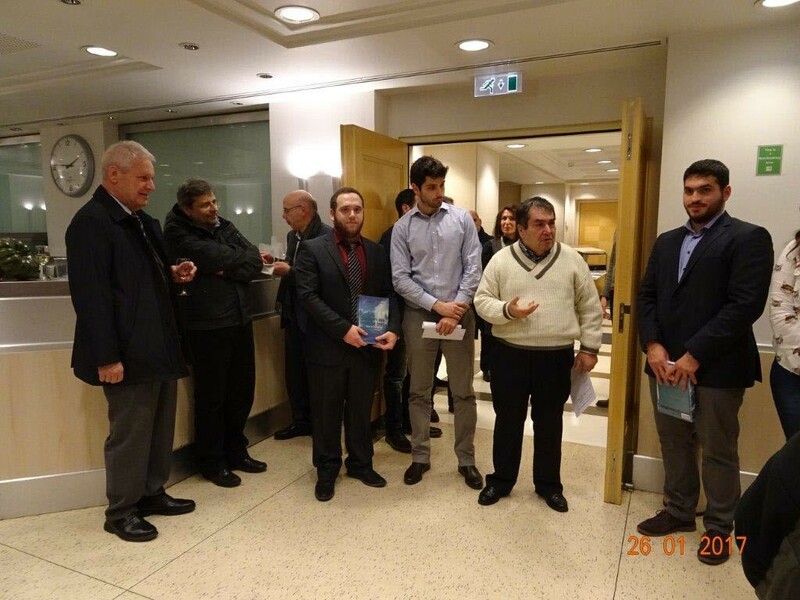 At the fifth Greek Section meeting for the 2016-2017season on January 26, 3 NTUA graduates, namely George Dafermos, Dimitris Georgiadis and Nikos Planakis, presented their thesis which they completed in 2016. Each one of them represented a different division of the School of Naval Architecture and Marine Engineering of NTUA. However, all of them had as an ultimate goal to show the value and use of their thesis on one hand, and the quality and standards of their research and presentation on the other. The meeting started with George Dafermos whose presentation focused on Investigation of Damage Stability of Passenger Ferries and Flooding Simulation of Ship Compartments. Its objective was to assess passenger ships' damage stability by modern design and simulation software tools, namely not exclusively via the examination of current SOLAS regulations; to investigate the behavior of the vessel during the flooding process and the anticipated time to sink/capsize; to demonstrate the drastic negative impact of open left watertight doors on the attained subdivision index A for the ROPAX design; and to examine the progressive flooding to intact compartments, as well as their overall survivability behavior by performing comparative numerical flooding simulations for the ROPAX as well as for the Pure Passenger ship. It was concluded that the Pure Passenger Ship has had superior survivability compared to the ROPAX of the same size and capacity, which confirms the findings of other similar studies. Once George Dafermos completed his presentation Dimitris Georgiadis took the floor and started his presentation on Conversion of Tanker Ship to FPSO and Study of Strength in Accordance with ABS Rules. The scope of this presentation was two-fold; To convert an oil tanker to FPSO and investigate the influence of the anticipated operation site of the FPSO on the volume of replacements and repairs that are needed. In particular, he examined how the operating site affects the requirements and consequently, the decision to proceed with the conversion or not. In order to do so two areas with different environmental conditions and two different departure locations were selected. The conclusion that was reached was determined by the methodology that was used, the investigation that was made in loading conditions, the structural assessment of the hull structure as well as the fatigue strength assessment that was performed at a critical structural connection of midship region. The third presentation was given by Nikos Planakis who focused on Control of Hybrid Diesel-Electric Marine Propulsion System. The objective of this presentation was to examine the feasibility of using model predictive control in a hybrid diesel-electric marine powerplant. In order to accomplish it the modeling procedure was divided into two parts; The first part aimed at finding linear models using datasets with experimental data at the nominal operation point of the hybrid powertrain and investigate the adoption of different signals considered as system disturbances, as the controller is capable to cope with multi-variable systems, while the second one looked into developing a non-linear multivariable model that could describe the hybrid powertrain behavior over a wider range of operation. The presentation was concluded by suggesting an output feedback manipulation in order to enable a better prediction of the future model outputs. A committee that comprised the local section’s Executive Committee members, academics, shipping industry representatives as well as online attendees evaluated the three presentations for their originality, content and contribution to science. Dimitris Georgiadis’ presentation was agreed that it outweighed the other two and he received a cash prize of €300.00. The other two graduates received a copy of Stability and Safety of Ships: Risk of Capsizing by V.L. Belenky & N.B. Sevastianov as a gift. Following the presentations, a Vassilopita was cut for the turn of the year and the winner of the coin received a gift from the SNAME Greek Section. The post-meeting reception was held on the premises of Maran & Alpha Tankers. The meeting was attended by twenty-seven (27) members including students and professionals and ten (10) non-members. The meeting was broadcast to SNAME members worldwide. Twenty (20) members registered for it. 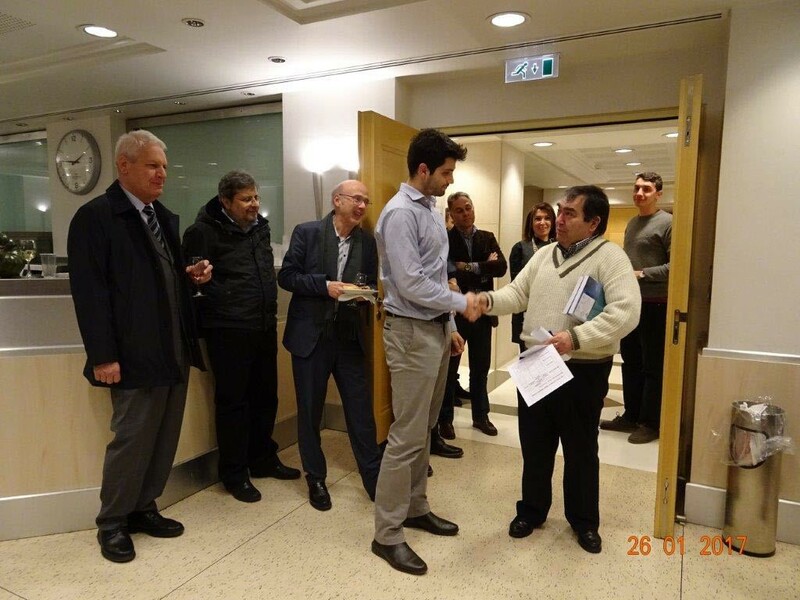 John Kokarakis (Greek Section Chairman) congratulates Dimitris Georgiadis on winning the first place at NTUA Thesis Competition.